Xenko saves your projects as Visual Studio solution files. You can open the projects with Xenko Game Studio or any IDE such as Visual Studio. Xenko organizes project files into packages. Each package comprises several folders and an *.xkpkg file which describes the package. A project can contain one package or several. You can share packages between projects. Assets contains the asset files which represent elements in your game. Bin contains the compiled binaries and data. Xenko creates the folder when you build the project, with a subdirectory for each platform. MyGame.Game contains the source code of your game as a cross-platform Visual Studio project (.csproj). You can add multiple projects to the same game. MyGame.Platform contains additional code for the platforms your project supports. 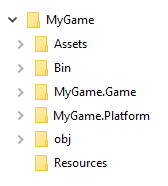 Game Studio creates folders for each platform (eg MyPackage.Windows, MyPackage.Linux, etc). These folders are usually small, and only contain the entry point of the program. obj contains cached files. Game Studio creates this folder when you build your project. Resources is a suggested location for files such as images and audio files used by your assets. For advice about the best way to organize your project, see the Version control page.